Today I want to write about a raptor that has a very unusual diet, the palm-nut vulture. These amazing birds grow to about 60 cm long and have a wingspan of 150 cm, making them one of the smallest species of Old World vultures. They are a very unusual bird of prey because they are mostly vegetarian, with most of their diet being made up of the fruit from oil palms, raffia palms and wild dates. They also sometimes eat crabs, molluscs, locusts, frogs and fish. At the start of the breeding season, pairs of palm-nut vultures soar together in an acrobatic display of rolling and diving. They build very large nests out of sticks high up in trees and lay a single egg, which both the male and female look after. Palm-nut vultures live throughout Africa and range from the Gambia in the west to Kenya in the east and down to the northern part of South Africa. They are very common throughout their range. 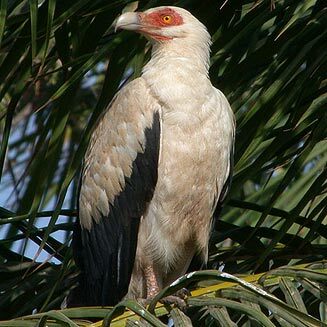 Are there any other interesting facts that you would like to share about palm-nut vultures?